Venue is closed, we miss it so much! One of the things I love most about writing these venue reviews is when I find a hidden gem. I've found that and more with La Palapa Del Mar of Belmont Shore. When I say hidden I mean it. You would never expect to find The Del Mar room at this place, even when you're standing in the parking lot. But once you see it you'll be impressed. However, I need to warn you, there are three stages of disbelief when it comes to La Palapa. Shock, uneasiness, and happiness. Shock- La Palapa is next to the Belmont Pier, in fact it shares the same parking lot as the pier. Upon entering the parking lot you'll probably think you are in the wrong place. On a summer day you see the local fishermen toting their polls too and from their cars. And there's sandy and sunburned children with bikes and boogie boards. Then there's the issue of paying for parking. The machines are standard for most beaches in Southern California. The one thought that goes through your head is "Hey this is cool if I'm whale watching, but for my wedding. . ." If you can make it out of the parking lot, things will get better. Uneasiness- When you walk through the front doors of La Palapa "Hey this is a nice place. There's a nice bar, next time I get fired I'm gonna come here and drink my worries away. But for a wedding?" Don't worry Maynard, this isn't where you will have your reception. Happiness- The restaurant is really attached to another building. The room you're interested in is upstairs in that building. You take a ramp up to the room. In other words, the restaurant downstairs has nothing much to do with the banquet facility upstairs. 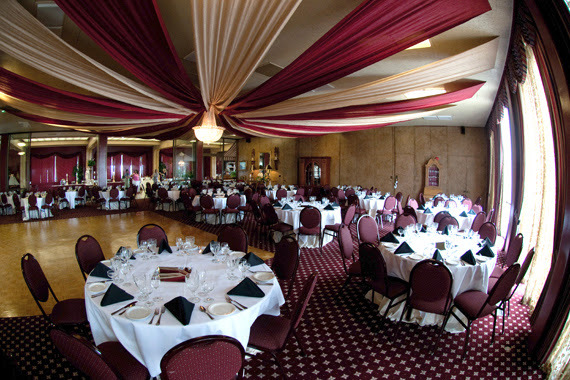 The banquet facility is a beautiful French Empire style room with a dynamic view of the Pacific and the pier. It honestly is a gem. You will be impressed. What type of couple will like this place? 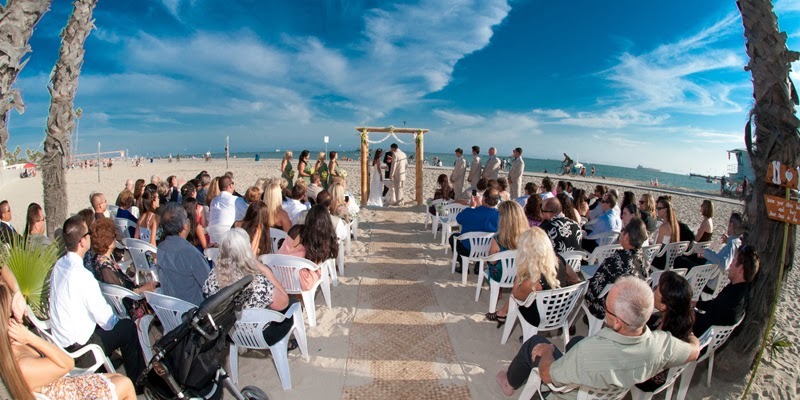 I think it's a common dream to get married on the sand at the beach ( a beachfront wedding). There aren't that many places that can do this in Southern California, not as many as you think there should be. The ones that do often have skinny cute young ladies wearing their finest polyester blend blue blazer and matching skirt worn below their knees. They hand you a packet with a polite smile. Somewhere in the literature are the words " $35K minimum on a Saturday night". And the pipe dream of a beach front wedding gets crossed off the list in favor of a something else. But wait, maybe there is an alternative. For years my client base has been middle class. I am fiercely loyal to them. Beach front weddings are usually the domain of rich people who can afford the fluff. When I see a place like La Palapa Del Mar, I get excited. It's in the same ballpark of costs as a nice golf course wedding. On the one hand it's not the Ritz Carlton, on the other hand it's a huge step up from most golf course weddings. My thinking is that if you can change your guest list a little or can find a few extra bucks and make this place work, you'll be happy you did. Are you kidding, this is the beach! Think of the photo ops. One other thing this place has going for it is that it's in Long Beach. I never get tired of Long Beach, there are a gazillion photo ops. The Del Mar room is to die for beautiful. Other than the parking lot keep in mind this is a public beach. 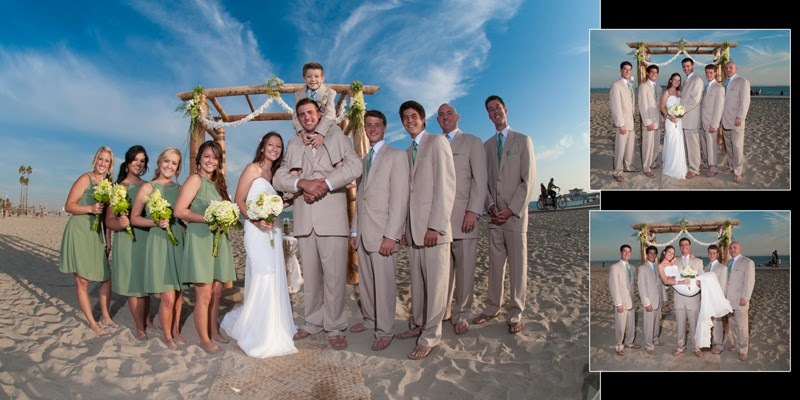 There is a realistic potential of having joggers and children in swim suits in your background during your ceremony. Another thing, be nice to the tourists. Some of these people don't get to the beach that often and if you have a photographer yell at them to get out of their background it doesn't go over well. It happened down in Newport Beach and the next thing I knew there was an ordinance against professional photography on the beach. Now you need permits to shoot at the beach and there are code officers writing tickets. So please please please, be considerate of the tourists. You won't deal with them once you get upstairs and start your reception. The food is great, the place is beautiful, this in and of itself is worthy of my endorsement. But the icing on the cake is the staff. This is a family owned business. Elizabeth is the coordinator, and has a mom and a couple of cousins who work with her. They are really great people, very warm and wonderful. I was there on a week day when a minor crises occurred and the family went into action. The amount of love and selflessness that went down was mind boggling. I don't see this that often, and when it occurs it's a wonderful thing. They care for each other, and they care for their clients. Each personality is unique and wonderful in their own way. And I like how approachable they are. Of course some people want static business transactions under the term "professional" and there are a sea of cute young gals out there in their polyester blend navy blue suits anxious to hand you the packet and start your vanilla wedding experience. As for me, I crave real people. I appreciate the small business person working hard to make their business a success. My final endorsement of this place is a bit unusual. In 2009 we did this bridal show and on the list we had six people we had inquired about the same date. A gal named Jessica intrigued me by mentioning this place. I've never heard of it before. Basically I hand picked her wedding (that doesn't happen that often) and I went through the entire experience with her. I saw the excitement of her mother as she entered the room for the first time (it looks even nicer when it's set up for a wedding). I first wrote the review about La Palapa a couple of years ago, and fortunatly I've been able to go back a few times since then and see the place in action. Many people check this place out online and now that I've seen this place in action on several occasions I can give some better insight on some things. If anything I have a founder appreciation for the place and the owners. I've had it now a few times and had a few different dishes. I am really found of theif buffet as opposed to plated meals. Both are good, but the buffet just seems to offer more choices. They have this chicken with a white sauce that is out of this world! The fish is excellent, and I swear they served Cornish Game Hens at one of the weddings I did. They do a spectacular job with the their food. Most wedding venues offer some chicken breast with frozen greenbeans combination. I've seen that a million times. La Palapa mixes it up. Your guests will be impressed that they aren't just serving "wedding food." Their food sets them apart from other venues. It's hard to explain this to people who live out of state but Southern California has many different communities. It's easier to think that the people of Nebraska are different than the people of Maine. The population of Orange County, CA is larger than the population of both Nebraska and Maine combined. Orange County has a population larger than 20 of our 50 states. But Orange County is the little sister of Los Angeles County. If Los Angeles County was a state it would be right behind Georgia as the ninth largest state in the country, based on population. It would be larger than Arizona, Michigan and New Jersey. So when I tell you that Long Beach has a different vibe that Laguna Beach even though you could go from one to the other in around one hour its not an exaggeration. Long Beach is a different feeling beach destination city. Those who claim to know Los Angeles from not livng in the area may not really know Los Angeles all that well. They may know about one area of Los Angeles. Pasadena is really different than Long Beach for example even though they are both in the same county. The beaches in South Orange County are pretty. You certainly feel like you're in more of an affluent area. The streets and the shops are well maintained and very trendy. A lot of Orange County's beach communities are based on interesting little places to spend money. When you go you feel compelled to look your personal best before you show up. Long Beach has a much different vibe, it's a ton more laid back. It's more like a "come as you are" and "everybody is welcome." As a community, I really am found of Long Beach. I've always really enjoyed the people of Long Beach, they are real people. When you get to La Palapa, the vibe reminds a bit of Maui. When you first show up to Maui you are moving at the speed of light compared to the locals. And after a while you slow down, relax, enjoy yourself. La Palapa has an enchanting vibe, it will set the pace for your wedding as someplace to relax and enjoy. The pace of the typical day. There is a room upstairs next to the ballroom that is red, and ornate. In the evening its a place where they have the coffee bar. If you get a photo booth they usually set up in here. This is the room that the gals get ready in. Guys getting ready is fairly simple and straight forward. They shower, shave and get dressed. If they've put on a tuxedo before this can be a very fast process. If not, they have to spend some time figuring how all the stuff goes on. For women, there is an art to getting ready. It's about as important than any other part of the day. Seriously, it's been a big deal for centuries. Your great, great, great grandmother wanted to look her personal best on her wedding day and dragged out the getting ready process though there were no photographers to catch her radiant beauty. The red room makes for a wonderful backdrop to this aspect of the day There are places to hang the wedding dress for photos and plenty of room for gals to spread out so everybody isn't all up in your grill. They can even flip the doors open to the outside so you get the sweet ocean breeze filling the room. The pace is certainly differnt when you get ready in the red room. I can't tell you how many times that I've seen brides get ready in cramped hotel rooms. Sometimes the rooms are so crowded that there is no place to put your stuff and the lighting is usually pretty bad. The red room rocks beause the lighting is good and with the door open you can hear the sounds of the ocean as you get ready. One other really cool aspect of the red room is that since you're next to the ballroom there are the thousand questions that need to be answered while you're in the general area. If you need to pop out of your makeup chair to go check out how how the flowers look on the head table as the florist puts them in place you can make that happen, then get back to your make up in seconds. There are no annoying phone calls with people trying to describe some complicated diagrams. You're there and you can just handle it. People are all ove the place down stairs right before the ceremony starts so we can't take you outside for portraits. You'll get noticed. Not to worry, I know a spot where you won't be seen and the lighint is go wonderful for portraits that I've made large prints and hung them in my bridal show display. It doesn't matter if it's sunny or not, this place just makes some outstanding images. I cannot describe the feeling of walking in to your own wedding ceremony other than the word "surreal." You are very aware of that moment in your life. The very popular Catholic Church St. Denis in Diamond Bar has a very short isle. From the time you start walking to the alter is about 20 seconds. Not enough drama for the experience. This is as best as I can tell what it's like to get married at La Palapa. After the minister greets you in the red room and goes over the agenda you'll start noticing things come together. The bridesmaids will get into position depending upone if they walk in with the men which is usually how I see it. They position themselves at the bottom of the stairs. You'll notice it gets very quiet all of the sudden. Dad will be there with you to give you some fatherly advice. My dad's advice was to always double down on a set of 8's in Vegas. You're up the stairs in this room which is probably around 50 feet up. You can peak around the corner and see people walking in. They won't see you. Then you'll hear the music change and it will be your turn. As you walk out onto the deck with your dad you'll see your husband and all your guest down below on the beach. By this point the nerves will hit you like a ton of bricks but you are so far back nobody will see you. The challenge will be to gracefully walk down the stairs. It's a fairly slow process and it only builds up the momemnt from the perspective of the crowd. By this point the people in the restaurant are dying of curiosity. Everybody else has walked in an they really don't know what's taking so long. As you get to the bottom of the stairs you will lose your nerves. Elizabeth will be there to straighten your dress. It's a brief moment of primping. If you have a good DJ (Station Identfification or Music On The Move) and if you so desire the music will change from something light and jazzy as you walk down stairs to the wedding march. Everybody stands up. Each step runs in pefect timing of your heartbeat. The sun is shining down on you. As you make your way to the main isle the people in the restaurant start telling you how pretty you are or how wonderful you look. It's this moment that complete strangers give you affirmations that is really cool. You smile as you get ready to make the sweeping left turn, head down a few stairs and hit the sand. Everybody you care about is in front of you. From their perspective you are getting larger and larger. They are thrilled. There are camras and phones snapping away and before you can even make it to the end of the isle your photos are up on Facebook. 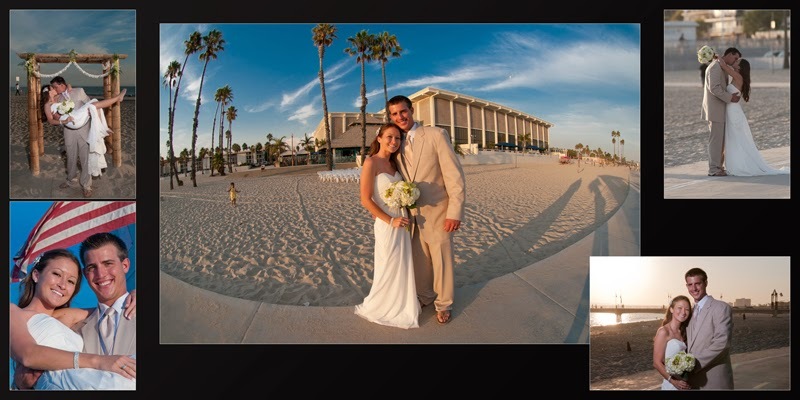 The dream of a California Beach wedding which is so illusive for nearly all brides is happening for you. You are getting married with the sand under your feet. It all depends on what you have planned. Don't rush it, it's a cool feeling to be standing on the sand at the beach. When it's over you walk up the isle and applause and smiles. Quite often the restaurant roars in applause. And you just feel like you won the lottery! This is the time for the photo session. The one big warning I can give you is that the best happy hour in the world is upstairs at their bar in the hallway next to the reception room. If you have a disorganized photographer, or someone who can't take command of the situation people will wander off to the cocktail hour and you'll be sending in the search and rescue crew to find them. Lots and lots and lots of wasted time. Depending upon the time of year when the sunsets it gets dark very quickly. There are so many amazing places to take photos along the beach and you can do it all if you have a photographer who is organized and good at dealing with people and timeframes. Once you get into the room it's about as good as any hotel in the area. I've often wondered about how people select venues. I had one client drop $71K on her wedding, and her reception was in a tent. The Del Mar room is a wonderful place. Once your inside it's truly something special. The bartenders really know how to throw down some good drinks. On warm summer evenings people often sit outside on the steps to get away from the reception for a few minutes. I've actually been one of the first to arrive and among the last to leave at La Palapa. The room doesn't seem to empty out as much as it does at other weddings I've gone to. I was chuckling when I read some of the reviews online about La Palapa. They are WAY off the mark. So, if you really must know about this place you can take it from me, someone who has been going to wedding venues for over 15 years all over Southern California and seen the good, the bad and the ugly. La Palapa is a hands on business. There isn't run by an absentee owner that has an underpaid GM running the show. The older lady is known as "Bear", as in "Momma Bear." I actually get a kick out of her because she is very perceptive. Yes, she can be brash and outspoken at times. But don't get fooled by her exterior. She cares a great deal about La Palapa and she wants to make certain that everybody has a good time. Two of her daughters work there. Elizabeth is the heart and soul of La Palapa. She'll be the one you deal with the most. She runs herself ragged making sure that weddings run smoothly. Her sister "Kat" (or "Cat") is also there. She does show the property quite often and is really a neat person as well, but seems to be a bit more quiet and reserved. She tends to float in and out fairly quietly and makes certain that everything gets handled. The one thing that the reviews didn't say about La Palapa is what people think when its all over. There is a crowd of people who are alumni of La Palapa. They've had their wedding there and they go back to have dinner or drinks. They can see the family and catch up with them. I am surprised to see how much Jessica (my first La Palapa bride) still goes to it and how she keeps up with their staff. The story behind Jessica was that I met her at a bridal show and six other people put their names down for the same date in July. I made a note about her beause she had a really great vibe about her. She introduced me to La Palapa and the next year she came with me to a bridal show where we met Kelli. The first time they met she and Kelli just talked for maybe 20 minutes. She told Kelli "Yes, by all means have your wedding at La Palapa." Kelli and her fiance wanted to meet with me at La Palapa go over the photography. Jessica came by to get something from me, they met again. As it turned out their husbands also hit it off and Kelli and Jessica are actually good friends now along with their husbands. La Palapa is a real place run by real people that really do care about their clients. If your vision is to have people in uniforms running around offering a generic wedding experience there are plenty of places that will gladly give you a homogenized wedding day experience. But after this many years of dealing with bland wedding venues I crave real people and real situations. Wherever you go you'll be spending a lot of money. At least I can tell you that the staff at La Palapa will work very hard for you to make certain you have a good wedding day experience. 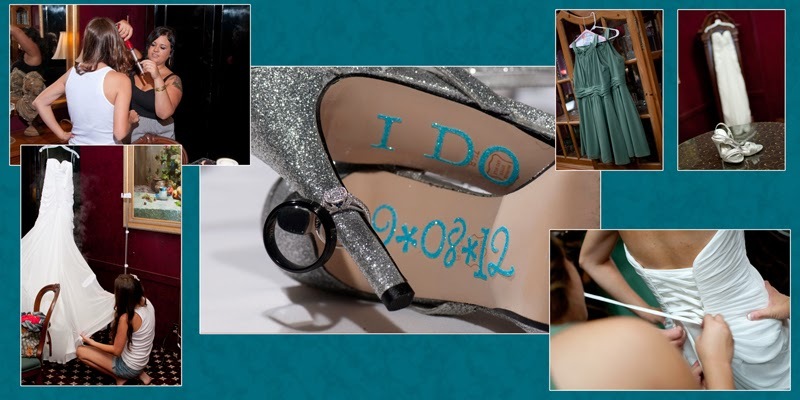 The wedding album layout you're seeing is proudly featured in our Gallery. Or click this link to go directly to this layout.